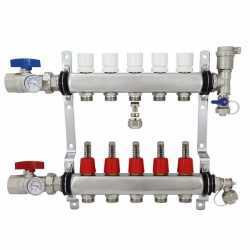 5-branch Radiant Heat Manifold, Stainless Steel, for PEX, 1/2' Adapters Incl. Home » PEX Supplies » PEX Manifolds » Radiant Heat Manifolds » Stainless Steel PEX Manifolds » Rifeng SSM105 5-branch Radiant Heat Manifold, Stainless Steel, for PEX, 1/2" Adapters Incl. 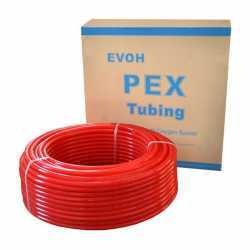 This 5 branch Stainless Steel PEX manifold is designed to help the user control their radiant heat applications ran through PEX tubing. It has the capability of covering up to 1200 square feet of area at one time. A manifold controls the flow of water from a designated area to the specified zone. All stainless steel PEX manifolds comes equipped with compression adapters for 1/2' inch PEX tubing, balancing valves, flow meters, and outlets.